Each week your pastor spends hours preparing his message: reading, studying, praying, researching. Then, for probably 30-45 minutes, he pours out his soul to the congregation in one concentrated dose. Most churches do their best to capture this moment by recording the audio and making it available to the congregation. While this audio has tremendous benefit, I’m sure you have discovered the intangibles that are present in a video recording: the body language, facial expressions, gestures, and cadence. Video doesn’t just provide a “richer” experience, it communicates more clearly to the viewer. In this guide we’re going to look at what it takes to record video of your sermons for distribution to your congregation. From there, we’ll look at how to go one step beyond and stream that video content live over the Internet. Recording video of your sermons is the next logical step after recording audio. If you’re already comfortable with the audio recording process, it isn’t a huge leap to add video recording to your repertoire. By adding video recordings to your sermon library, you’ll be able to offer your viewers all the benefits of visual communication: increased clarity, nuance, and understanding. And you don’t have to break the bank to do it. The camera, of course, is the main piece of equipment you’ll need. In the past a high-quality camera was an expensive purchase. Thankfully, technology has advanced so far that an affordable camera of excellent quality is available to just about any church, no matter how small the budget. When choosing a video camera there are many options, but only a few critical features that you need to be aware of. If you’re going to be livestreaming you’ll need a camcorder that has live HDMI video out. You will connect the video camera to a transcoder, which will connect to your computer. If the video camera doesn’t have the ability to send live video out, you won’t be able to get the data you need to stream. If you have no intention of ever livestreaming with this camera, then you don’t need to worry about this. If you’re going to put your camera in the back of the room you’ll have to zoom in quite a bit to get a good framing of your subject. What’s important when looking at a camera is optical zoom factor. Digital zoom factor is a useless number. Digital zoom is always a shoddy way to zoom by just blowing up the pixels in the image, rather than optical zoom that actually moves the lens elements like a telescope to get a better view of your subject. Most cameras today offer at least a 10x optical zoom. You’ll want at least 10x to have a good cushion available, more if you are in the back of a large room. There are loads of great cameras out there that will meet your needs. But if you just want a recommendation for a camera that will work great and has all the features you need, let me encourage you to buy the Canon Vixia HF R800. The R800 was $299 on Amazon at the time of writing. If you’re more a Sony person, you might want to try the Sony HDRCX675/B, which was $498 at the time of writing. To store the video in the camera, you’ll need a memory card. Memory cards are inexpensive, but you don’t want to skimp on this. Get a name-brand card (imitations tend to fail early or perform poorly), and get a card that’s at least class 10. Slower cards may have trouble keeping up with the recording. A good memory card right now is about $20-$30. Typically your camera will be in the back of the room, and as a result you’ll need a tripod for mounting the camera. If you’re looking for a Set-It-And-Forget-It style of setup, then you can go with a traditional style tripod, and you don’t need to spend much. The Ravelli APLT4 is $26 on Amazon, and should work great for you. If you plan to have a camera operator who will be panning around the stage while your preacher moves, then you probably want to spend a bit more for a smoother action. One easy option is to get the Ravelli tripod and add a Fluid Drag Head to the top like this Pro YT-950 ($35). The fluid drag head goes right onto the tripod, then the camera attaches to the drag head. The fluid drag head will give you a nice, smooth, side-to-side panning effect. Sync Audio In Post In this scenario you record your audio just like you have been, and you use editing software to add in the high-quality audio track to your video after you’ve recorded. Provide a Feed Directly to the Camera For this option, you’ll provide a feed directly to your camera, just like you already do to your audio recorder. You’ll need an audio cable to go from your sound board to the camera, and most likely a Direct Box to prevent buzzing or humming in the recording. Once you’ve recorded the video onto the camcorder you’ll need a way to get that video off your memory card and into a video hosting service. You might also want to add a small church logo or other introductory segment at the beginning or end of your video. If you have no desire to trim the video or edit it in any way, you can use Handbrake to convert your video to an MP4 format for uploading to a video hosting service. Here’s a great article about how to do this. If you want to edit your video in any way, whether to adjust the audio, add an intro, outro, lower thirds, or any other type of enhancement, you’ll need extra software. The two major players in this market are Adobe Premier and Apple Final Cut Pro X. Both are great pieces of software and have equivalent features. Both can export your video for uploading to a hosting service. And both are complicated enough that their use is outside the scope of this article. Check YouTube or Linda.com for tutorials. Once you’ve finished doing any edits to your video file, you’re ready to upload that file to a video hosting service. The video hosting service makes your video available on the Internet for anyone to view. They ensure the video can work on a variety of devices all across the globe. The two major services in this market are Vimeo and YouTube. Each have equivalent features (like allowing you to embed the video on your own website). To use Vimeo you’ll likely need a Pro plan ($199/year). YouTube, on the other hand, is always free to upload. You can do this! Purchase a camera and the related equipment, point your camera at the stage, and press the record button. Setup an account at YouTube and upload your first video. You’ll get better with time, which is the secret to success: practice, practice, practice. If you’d like to dip a toe in the water of livestreaming, but don’t want to jump all the way in yet, livestreaming just the audio of your sermons can be a great way to get started. By streaming the audio, your congregation can following along at home or on the road, using any device they own. And, streaming audio requires very little bandwidth compared to video. So if you’re a portable church with limited WiFi, or a rural church on DSL, audio is likely the solution for you. We here at Sermons.io have a 1-Tap livestream solution for audio. You just download the app, tap Go Live, and you’re done! There is no easier way to get started with livestreaming. Livestreaming video is the culmination of all of your church’s technology teams working together. It required coordination between video equipment, video operators, computer operators, and sometimes network managers. It’s a lot of work to setup, but the end product is absolutely worth it: the sick, the shut-ins, and the seekers will all be able to experience your service in a much deeper way. You’ll be able to minister to those who need it most, spreading the reach of the gospel farther than you’ve ever been able to before. 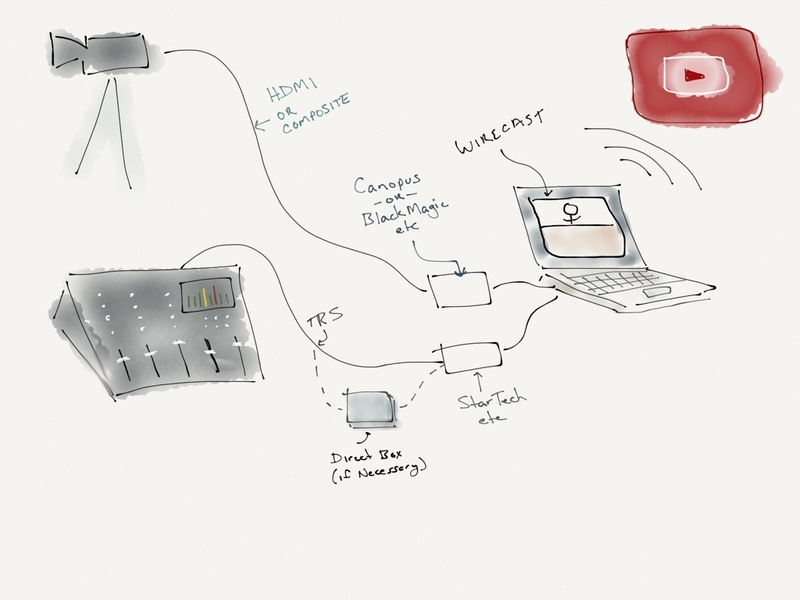 Figure: A typical livestream equipment diagram, as explained below. The transcoder (or video converter, depending on your setup) accepts a digital video input and outputs an optimized data stream that your computer can handle. There is a ton of data in a video stream, and the transcoder essentially breaks that down for your computer into a manageable flow that it can swallow. Currently, we recommend the Black Magic UltraStudio Thunderbolt. First Note: Reports are that the HF R500 does not play well with the Black Magic Intensity models. However, if you’re using a different camera, things may work better for you. If you try out the HF R700 with an intensity and have good luck, please let us know. Second Note: You must have USB3 or Thunderbolt for those devices to work. USB2 will not work. This means you might need a new computer, or a new card for your computer (see below). If you’re not sending your audio feed directly to your camera, then you’ll need a way to get that audio feed into the computer that’s managing the stream. Getting high-quality audio is vital to your stream. The best source of audio is going to be straight out of your soundboard. If you are able, talk to your sound engineer and ask for an auxiliary output that contains only the channels of audio that you need for your stream. For example, if you’re only going to stream a sermon, ask that any instruments not be included in the feed. Typically, your sound engineer can get you a feed via a balanced input, which will be in the form of TRS, or as most people think of it, a 1/4” audio plug. From there, you can connect your audio feed directly into your computer (you might need an adapter). For more control, and sometimes a cleaner signal, you might want to try a USB audio adapter like the StarTech USB Stereo Audio Adapter. In order to process HD video in real time and upload it to the internet you’re going to need a decent computer. Any mid-to-high range computer purchased since 2013 or so will probably be fine. If you can’t decide what to purchase, my recommendation is to get a 13” Macbook Air. It’s a fantastic computer, extremely portable, and will get the job done for you. You can certainly drop down to cheaper options (try NewEgg.com or Tiger Direct). If you get a Windows computer you’ll want something with at least an Intel Core 2 Duo near 2GHz or higher. There are just so many options in this space that you’ll do well to consult your local IT helper and get her advice on a purchase like this. Streaming video in real time uses a lot of bandwidth. Most internet service providers love to advertise their super fast download speeds and then high in the fine print their much slower upload speeds. But, when streaming, all you care about is upload speed. To stream HD video you’ll need at least a 5Mbps Internet connection on the upload side. Contact your ISP if you’re not sure what your speeds are. To get an estimate you can always try SpeedTest.net. If you have the option, always use a wired ethernet connection instead of WiFi for your livestream broadcast. WiFi is going to be subject to congestion and interference that a wired connection will never face, and even on the best day WiFi has to deal with problems a wired connection will never have. WiFi certainly can work, and at my church that’s our only option in our facility, so that’s what we use. But we face periodic connection and bandwidth issues that we’d never face if we were able to connect via ethernet. When I first wrote this article LiveStream.com was about the only game in town. They had a great service, but the ads were a bit tiresome. Since then, YouTube has broadened the availability of their live stream platform to the point where now anyone can get access to it. If you decide to go with YouTube you should checkout their introduction video as well as the help section on live events. The service is extensive, and I could write an entire article just on using the platform (and perhaps I will at some point). Use whichever livestream service seems to work best for you, but I recommend YouTube for live streaming. You’ll need to run Streaming Software on your computer. The Streaming Software communicates with the Service to send your video in real time. YouTube has struck a deal with Telestream to create a special version of their WireCast product just for YouTube. It’s called WireCast Play for YouTube and it’s free. If you need more features you can pay to upgrade. If you’re sticking with livestream.com you will use LiveStream Studio, which is also free. Now that you have all the components it’s time to tie it all together. Here’s the diagram once again of how all these pieces fit together. The Video and Audio plug into their adapters (if necessary), which plug into the computer, which is running WireCast or LiveStream Studio, which will stream you video up to the web. Once you have the hardware connected, you’ll need to setup you live event in YouTube and then direct your viewers either to your YouTube channel or to your website (where you’ll need to embed the video via the embed html that YouTube provides). If you’re using LiveStream.com then you can do the same thing, directing people to your channel or embedding the video right on your site (depending on your account level). Finally, let you congregation know about the new service! Don’t miss the opportunity to serve the congregation that’s present on campus on Sunday. The Cry Room is a great place to stream your service so parents can view the service (if you have an overflow room that’s another obvious use-case). A great way to get started with streaming across the church is to buy an inexpensive Chromebook like this one from ASUS. Drop that in the Cry Room and set the default homepage in Chrome to your streaming site and you’re good to go. The Chromebook will wake up in about 1 second (seriously), and if you’re a portable church like we are, it’s easy to store during the week. The built-in speakers are sufficient to listen in any small to medium sized room, so you shouldn’t need any extra hardware to get started. Get big ones. You’ll never regret having extra storage space. If you’re having trouble with your wifi connection you might try a dedicated directional high-gain WAP just for the livestream. Something like the ENH500 can make a big difference. One more tip: never share the same WAP between the congregation and the livestream. If you’re stuck on any of these details feel free to reach out to me via twitter: @mcphat. I can’t necessarily show up and hook it all up for you, but I can try to point you in the right direction. I’ve included Amazon Affiliate links on all the Amazon links in this article. If you use the links in this article to make purchases, we will receive an affiliate fee from Amazon in most cases.